Marketing Automation: No it’s NOT Spam! The term “marketing automation” initially sounds like an impersonal, robotic takeover of your precious marketing team and process. Many business owners jump to the conclusion that it means spam. This couldn’t be further from the purpose of marketing automation. There is nothing to fear since marketing automation is simply a means to streamline the marketing process once you have a decently sized customer base. In actuality, once your number of customers becomes difficult to manage manually, marketing automation helps to make your marketing more personal! Marketing automation is about staying in touch with your prospects or customers who have opted in to receive information from your organization. It’s about nurturing that relationship and staying top of mind. So what is marketing automation, really? There are many definitions out there, but they all seem to point to the same aspects: marketing automation is software and processes that automate, streamline, and consolidate manual marketing processes to be more efficient for a business. Basically, it means that businesses let computer software handle marketing practices that become tedious when done manually. Okay, but what does that actually look like in real life? 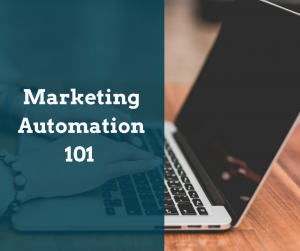 One of the most common forms of marketing automation is automated email marketing. When you do email marketing, you will typically incorporate some automation to make the process more efficient; you might have segmenting software that sends emails with the same opening lines to customers and prospects, but parts of the main body are customized according to their particular market segment. You might also use automated analytics tools that track customer and prospect responses and activity. Those who watch videos will receive emails with video content in the future, while those that don’t engage with past videos will instead be sent a link to download a pdf. Understanding that different types of people interact with media differently and being able to deliver the right content to the right person is at the core of marketing automation. Marketing automation is not email marketing but processes in email marketing can be types of marketing automation. So what else can you use marketing automation for? What processes could become automated? Marketing automation can be implemented in email marketing, web behavior tracking and segmenting, social media posting, landing pages, and analytic tracking. Now, this does not mean that these processes and strategies should become cold and mechanical. You still must communicate in an engaging and authentic way. Although it’s ultimately up to you, the businessman or woman, in what manner your marketing campaign is automated, your campaign must still feel human and convey that you really care about each and every one of your customers and prospects, whether that number is 5,000, or 50,000 or 5,000,000. Really, this is what web behavior tracking is for, but you always need to be on top of what your marketing looks and feels like to maximize positive responses, whether that is in direct sales, building brand, or establishing trust and reliability with your customers and prospects.